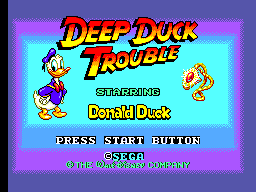 Deep Duck Trouble Starring Donald Duck, known as Donald Duck no Yottsu no Hihou (ドナルドダックの４つの秘宝) in Japan, is a Sega Master System and Sega Game Gear platform game starring Donald Duck. It can be seen as a sequel to The Lucky Dime Caper Starring Donald Duck. Game Designers: Sharusharu, Otanuki SP. Main article: Deep Duck Trouble Starring Donald Duck/Magazine articles.